If 2018 has you in a “new year, new home” mindset, you’re not alone. 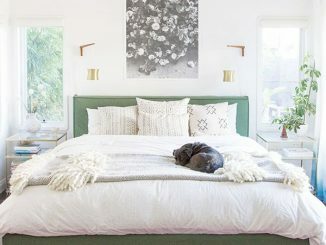 Thankfully, designer Emily Henderson chatted with us about how to give your sanctuary spaces—your bedroom and bathroom—a fresh start for the new year. Emily—ever the stylish ambassador for Target—used pieces from the retailer’s Project 62 and Threshold brands to update her friend’s bedroom and bathroom, a much needed change after all the holiday craziness. We asked her tips on everything from what trends are sticking around in 2018 to how best to deal with a making a rental bathroom your own. Check out her expert answers (and the refreshed rooms) below. What’s one thing that, when changed, has the biggest impact in a bedroom or bathroom? Linens, linens, linens. Refreshing your linens is the simplest and most effective way to change up your bedroom and bathroom. The winter weather inspires a need for cozy layers on the bed – new sheets and a cozy sweater knit blanket at the foot of the bed add warmth for an effortless upgrade to the room, while decorative pillows help tie it all together. In the bath, swapping in new bath towels or a neutral embroidered shower curtain can instantly create a relaxing feel by adding a bit of spa-like luxury to your space. Any easy switches people should make when looking for a quick refresh? A new piece of artwork can easily transform a room. In your bed and bathroom, don’t be afraid to use a large piece of art as a focal point just like you would in any other room of your home. I love the Project 62 Framed Abstract Wall Canvas, which works just as well in the bathroom or bedroom as it does in a common living space like the living room (ahem, I have it in mine, actually). I also look for wall accents for some added texture and visual interest, such as the Project 62 Modern Wall Tapestry or Framed Knots Decorative Wall Sculpture. Lastly, add plants and flowers as a finishing touch to bring the room to life. Is there anything that people overlook when trying to change up their space? 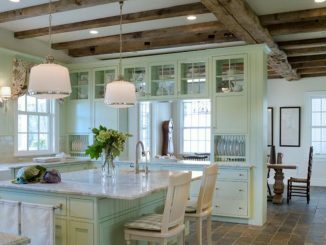 Don’t try to do too much at once – you do not need to swap out your furniture or larger pieces. 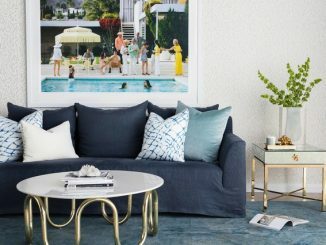 A January refresh is the perfect time to transform the overall vibe of your home through a few small upgrades and decorative tweaks. I would focus on a few impactful areas you would like to change and leave the rest. Are there trends from 2017 that you see hanging around for 2018? What do you think will be new in 2018? So much has staying power, but with slight tweaks. The millennial pink palette will continue into 2018, but we’ll see this morph into rose and mauve. At the same time people are taking more risks with bolder colors again on walls and upholstery in particular, and yet I’m seeing fewer patterns everywhere. Everything is handmade and yet refined. Any tips for dealing specifically with a rental bathroom, where you can’t change anything major? When working with a rental bathroom, think about those small upgrades that will make your space feel like a spa – layer in candles, greenery, plush towels and a cozy bath mat to warm up the room. You’ll also want functional and stylish storage solutions, such as baskets or simple hooks for towel storage, and matching vanity décor to dress up the space around your sink while keeping your clutter organized, like the Project 62 Modern Rose Gold Bathroom Accessories. Switch out the hardware, sconces and if you hate that towel bar, replace it with a simple hook. What’s one thing every bedroom should have in the New Year? Every bedroom in the New Year should have calm color scheme – this may be different for everyone, but for me, that includes denims, grays and some pale pink accents, which evokes a cozy California winter feel. Patterned pieces like the Threshold Navy Fringe Lumbar Pillow are a great compromise to keep the color palette neutral but still add some pops here and there.